The basis of geophysical information collected in CBDG are geophysical reports stored in the National Geological Archives (NGA). The web application that provides the data from the Subsystem CBDG ARCHIVAL REPORTS has advanced functionalities for data search and retrieval. 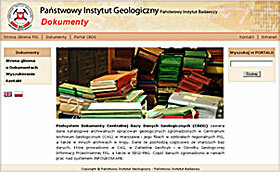 This subsystem contains catalogue data of archival geological reports from the NGA in Warsaw, its offices in the PGI regional branches and other archives in Poland.